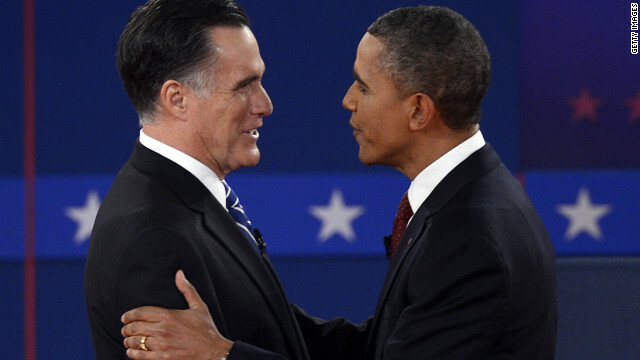 (CNN) - President Barack Obama and Republican presidential nominee Mitt Romney met in Hempstead, New York Tuesday evening for the second of three presidential debates, moderated by CNN Chief Political Correspondent Candy Crowley. candidates will oblige by keeping their answers concise and on point. booing or outbursts of any sort. President Barack Obama and Governor Mitt Romney. Jeremy Epstein, who has a question for you. that when I graduate, I will have little chance to get employment. I will be able to sufficiently support myself after I graduate? an apartment. I can't begin to pay back my student loans." we make it easier for kids to afford college. Massachusetts, it's a public institution. able to get a job. country are going to recognize, we're bringing back an economy. that, and make sure that when you graduate - when do you graduate? be president. I'm going to make sure you get a job. Thanks Jeremy. we can do is to make sure that we are creating jobs in this country. But not just jobs, good paying jobs. Ones that can support a family. American auto industry and it's come surging back. States and creating jobs here. all around the world to new markets. out there right now and the jobs of the future. cuts so that we can invest in education like yours. future is going to bright as well. they haven't put Americans back to work. workforce, it would be 10.7 percent. help people across the country that are unemployed right now. Airlines and come out stronger. And I know he keeps saying, you want to take Detroit bankrupt. to take the auto industry bankrupt, you actually did. tell you his prescription wasn't going to work. workers, strip away their pensions, and you still make money. last decade. That's what's been squeezing middle class families. And we have fought back for four years to get out of that mess. the job of the Energy Department? I've also said is we can't just produce traditional source of energy. production like wind and solar and biofuels. of energy right beneath our feet with natural gas. going to keep gas prices lower. built right here in the United States. sure that you're not paying as much for gas. on federal lands, and in federal waters. the Bakken Range in North Dakota. What was his participation there? migratory bird act to go after them on a criminal basis. the right course for America. are already beginning to come back because of our abundant energy. more drilling, more permits and licenses. world the president said no to that pipeline? I will never know. America, and that's what I'm going to do. down, or are we looking at the new normal? encouraging it and working with the industry. down. And now suddenly you're a big champion of coal. it'll save money in your pocketbook. strategy, and that's what we're going to do in the next four years. ROMNEY: But that's not what you've done in the last four years. licenses on federal land and federal waters in half. federal land and federal waters? did you cut them by? drill on public lands, you use it or you lose it. are now reletting them so that we can actually make a profit. coal jobs are not up. chance in a moment. I'm still speaking. $4.00 a gallon. The price of electricity is up. gasoline would not be $4 a gallon here. Is that true? same policies that Governor Romney's now promoting. prices because with his policies, we might be back in that same mess. pipeline to wrap around the entire earth once. Governor Romney says I'm opposed. I'd get rid of it. Iowa and that - they're not phantom jobs. They're real jobs. ROMNEY: I appreciate wind jobs in Iowa and across our country. ROMNEY: - we're taking advantage of our energy resources. country. It's critical to our future. and all these folks that have been waiting. some deductions in order to make up for the loss in revenue. the - oh, what's that other credit? I forgot. which are important to the middle class? income taxpayers to have lower taxes. go down $4,300 a family, even as gasoline prices have gone up $2,000. families. That's part - that's part one. the income tax the nation collects. So that'll stay the same. tax on your savings. That makes life a lot easier. middle-class? Because under the last four years, they've been buried. And I want to help people in the middle-class. jobs again in this country. over the last decade. Over the last 15, over the last 20 years. So four years ago I stood on a stage just like this one. tax cuts for middle-class families, and for small business. got to make sure that the wealthy do a little bit more. because they want tax breaks for the top 2 percent. exemptions and deductions, particularly for people at the high end? to keep more of their capital and hire people. when the president took office. corporates, changes in the tax code, it costs about $5 trillion. Americans. That's another trillion dollars - that's $8 trillion. add to the deficit and he's going to cut middleclass taxes. we - we're not going to get money that way. people, because the math doesn't add up. percent reduction in tax rates. it that's serious, actually believes it adds up. completely foreign to what my real plan is. from $10 trillion of national debt, to $16 trillion of national debt. ROMNEY: And I just described - I just described to you, Mr.
Mr. President, the next question is for you, so stay standing. only 72 percent of what their male counterparts earn? her bosses during the course of her career. She didn't complain. That's not what you did in that generation. need, because women are increasingly the breadwinners in the family. middle-class issue, and that's why we've got to fight for it. including millions of young women, all across the country. going to be able to compete in that marketplace. to continue to push on this issue for the next four years. applicants seemed to be men. find folks," and they brought us whole binders full of women. leadership positions than any other state in America. staff, for instance, had two kids that were still in school. dinner for my kids and being with them when they get home from school. mentioned 31/2 million women, more now in poverty than four years ago. that they would otherwise not be able to afford. million people looking for work is not a strong economy. getting a stronger economy and by supporting women in the workforce. and - and earn a living for their family. These are not just women's issues. These are family issues. part of what I'm fighting for as president of the United States. And, Governor, it's for you. return to the policies of those years should you win this election. do you differentiate yourself from George W. Bush? another, and it isn't quite as (inaudible) you think. question is on the floor. statement of my policy is completely and totally wrong. ROMNEY: Let me come back and - and answer your question. what he would have done. didn't. I'm also going to dramatically expand trade in Latin America. Number three, I'm going to get us to a balanced budget. the next area I'm different than President Bush. And then let's take the last one, championing small business. Our party has been focused too long. I came through small business. think about it, they tell you it keeps them from hiring more people. President Bush has a very different path for a very different time. and middle class folks not doing well. are building surveillance equipment for China to spy on its own folks. single one that's been decided. some things where Governor Romney is different from George Bush. because it's in the same wheelhouse, so you will be able to respond. told you I'd cut taxes for small businesses, and I have. affordable insurance, and I have. is the commitments I've made, I've kept. made some commitments as well. And I suspect he'll keep those too. education, and helping kids go to college. He said, "Me too." When they said, "We're going to cut Planned Parenthood funding." He said, "Me too." When he said, "We're going to repeal Obamacare. health care plan that he passed in Massachusetts and is working well. but you should expect that those are promises he's going to keep. are going to be much better either. hasn't even made a proposal on either one. would deal with our immigration challenges. Didn't even file it. implemented fully, it'll be another $2,500 on top. working again. He keeps saying, "Look, I've created 5 million jobs." were on food stamps. Today, 47 million people are on food stamps. year than last year, and more slowly last year than the year before. economy take off and grow like it could have. people that have dropped out of the workforce. hope and optimism they deserve. ROMNEY: Thank you. Lorraine? Did I get that right? Good. green cards, rather, to people who graduate with skills that we need. should make sure our legal system works. Number two, we're going to have to stop illegal immigration. will not grant amnesty to those who have come here illegally. that kind of pathway to become a permanent resident. the president will have a chance to answer right now. bigger dreams than they have. create jobs here in the United States. here, pledged allegiance to the flag. Think of this as their country. Understand themselves as Americans in every way except having papers. And we should make sure that we give them a pathway to citizenship. they'll leave. He called the Arizona law a model for the nation. undocumented workers and check their papers. said that, this is not something I'm interested in supporting. that the president made and - and - and let's get them correct. illegally, that that was a model for the nation. That's number one. promise to do as he said. where they have better opportunities. crimes we got to get them out of this country. Chinese investments and so forth. including in - in Chinese companies. big as yours so it doesn't take as long. policy. And it won't help us grow. about this issue at all. And it's time for them to get serious on it. CROWLEY: Mr. President, let me move you on here please. Mr.
friends at Global Telecom Supply (ph) in Minneola yesterday. the attacks that killed four Americans. Libya, but at every embassy and consulate in the region. Afghans are responsible for their own security, that's what I'm doing. come home. You know that I mean what I say. it was a terrorist attack. Middle East. Look what's happening in Syria, in Egypt, now in Libya. behind, and this strategy is unraveling before our very eyes. then have the governor just quickly. said that we're going to hunt down those who committed this crime. coming into Andrews Air Force Base and grieving with the families. or mislead when we've lost four of our own, governor, is offensive. what I do as Commander in Chief. into the Rose Garden and said that this was an act of terror. was an act of terror. CROWLEY: It - it - it - he did in fact, sir. OBAMA: - about foreign policy. chance to get some of their questions answered. Internet and from this crowd. do to limit the availability of assault weapons? presidency, where I've had to comfort families who have lost somebody. bedside of her son, who had been shot in that theater. fortune and whose sons or daughters or husbands didn't survive. there's an awful lot of violence and they're not using AK-47s. They're using cheap hand guns. enforcement, we can catch it before it gets out of control. amazing numbers out of the hands of criminals and the mentally ill.
laws that we have, and to change the culture of violence that we have. perhaps less violence from that. But let me mention another thing. And that is parents. We need moms and dads, helping to raise kids. ultimately gave them to - to drug lords. with these mass killings? Why is it that you have changed your mind? we have right now in Washington is a place that's gridlocked. you would be for it? starting to succeed. We're starting to see gains in math and science. another chance, training them for the jobs that exist right now. an education that they weren't able to get before. the choice in this election. that doesn't grow our economy. has been China. China is now the largest manufacturer in the world. last four years. That's total over the last four years. it's more attractive to come to America again. here, has never worked anywhere. goods are low. And that makes them advantageous in the marketplace. world play by the rules. But let me - let me not just stop there. the world for businesses of all kinds. if we're going to create more jobs here. under this president. I talk to small businesses across the country. They say, "We feel like we're under attack from our own government." keep China playing by the rules. going to go to our last question. and not have to get taxed, so they have tax advantages offshore. Now, Governor Romney actually wants to expand those tax breaks. the reduced rate that Governor Romney's talking about. problem is they'll be in china. Or India. Or Germany. American workers and American businesses are getting a good deal. Now, Governor Romney talked about China, as I already indicated. them hard. And we've put unprecedented trade pressure on China. That's why exports have significantly increased under my presidency. That's going to help to create jobs here. iPad, the Macs, the iPhones, they are all manufactured in China. China that's a counterfeit Apple store, selling counterfeit goods. fair basis, that's number one. get wages like that. It can't be sustained. high skill jobs. That's why we have to emphasize manufacturing. world, we will lose that race. years from now, 100 years from now. Green, because he's going to have the last question to you first? misperception and set us straight? who's very different than who I am. percent of the American people to have a bright and prosperous future. the experience I have, the American people. ROMNEY: I understand that I can get this country on track again. have to settle for 23 million people struggling to find a good job. get us on track to a balanced budget. The president hasn't. I will. them for coming - coming generations. The president said he would. these things. I served as governor and showed I could get them done. government creates jobs, that that somehow is the answer. system is the greatest engine of prosperity the world's ever known. should play by the same rules, because that's how our economy's grown. That's how we built the world's greatest middle class. And - and that is part of what's at stake in this election. refuse personal responsibility, think about who he was talking about. to hopefully advance their own dreams, but also this country's dreams. asking for another four years. On that note we have come to an end of this town hall debate. Hofstra University for their hospitality. Day is three weeks from today. Don't forget to vote. Obama is winning the Quick Vote on CNN and MSNBC. You know republicans are scared when they begin blaming the moderator and timing issues smh, even Candy had to correct Romney for his "mistake" (cough, lie) about what the President said. Obama won and will be our President for the next four years! Andrew, you cannot fool us. Ur a rob-me plant. We all know mittens secret accounts on China. Mitt is a traitor. CNN -Pres Obama spoke of terror in general, not that this was a terrorist act. Show the whole clip, not just that sentence. Quit molding the news and simply report it. Just lost all respect for Candy. Totally in the tank for Obama on question selection, timing & Libya. Disgusting. Please stop trying to convince society that fully automatic AK-47 rifles are common in the US. They ARE NOT! If my 9 year old knows the difference between fully automatic rifles, and semi-automatic rifles, so should you! My 9 year old is also able to see through your pathetic attempt to scare people by using the term “assault rifle”. "Trickle-down government has never worked here, has never worked anywhere. I want to make America the most attractive place in the world for entrepreneurs, for small business, for big business, to invest and grow in America." from 1979-2007, after-tax and after-inflation wages INCREASED by 18% for the lowest 20% of wage earners, and almost 40% for the middle class (60% off wage earners). Americans make up HALF of the world's top 1%. That's about 1 out of every three people who have a job! Even America's lowest 5% of wage earners are better off financially that 2/3 of the rest of the world. All that power Obama had the first half of his term with the Democrats dominating both the House and Senate. He could have changed the tax rates on rich but didn't. He could have pushed immigration reform but didn't. He could have done anything he wanted to in order to make this country great again and decrease the deficit but he did nothing but blame a prior administration, who was dominated by the Democrats in both the House and Senate. Obama was and is the President of talk and not much more. Bill Clinton reduced the national debt by 360 billion dollars, but did not even come close to paying it off (it was 5.6 trillion dollars when he was done). They projected that in another 10 years they could reduce it by another trillion dollars but somehow the ignorance of the American people got George Bush elected and he doubled the national debt to 11.3 trillion dollars. Unfortunately for Obama he took over office while Bush had the country in an economic crisis and two needless wars. He's facing an uphill climb and it's unlikely he'll be able to turn the economy around in his first term. To get out of debt he'll have to raise taxes, that's just the way it works. I really think that this evening Pres. Obama won the debate. Gov. Romney is too agressive, non specific, and lies all over the place. I want to know why nobody during this campaigne speaks about Mormon's bible that has written black on white that people of color do not have a soul? This is a big issue! How can Romney become President over a bunch of evil spirits? (according to Mormons belief) Please I need an answer. With this transcript you can really notice a trend. One candidate seems to be giving real answers and the other candidate seems to just say, "I know what it takes" without giving any other kind of answer. I'll let you determine who is who. "Going AFTER all acts of terror" is FAR different than saying a specific event "was an act of terror." First of all, I would rather keep my weapons, If the government tried to take control, we would not be able to stop them. Second of all, I am 18, and most of my friends agree that Obama does not have the business specialization we NEED, not want NEED, Romney however has. For third's I agree, I don't want another President *Bush*, However I don't want a president who will lie, and give a bunch of Mexican drug lords *Government Official* weapons to attack our border patrol, in this case I think he was going to try and use this to get rid of our right to bare arms, I don't want a lie for a president, if one man is going to decide all of our fate, I would rather have someone I know I can trust, so far I don't see that in our president today, also I am very grateful that we finally have now an African American President, but in this case, all I want is someone whom I can put my trust in, and so far Romney has done so, my vote goes to Romney. Saying you'll "go AFTER all acts of terror" is FAR different than saying a specific event "was an act of terror." Wait, didn't Romney also say he was going to create 12 million jobs? Which is it? Obama alltheway – We now know about Obamas also has investements in Chinese companies. Romney said that he functioned as a "Pastor" in the Mormon church. The Mormon church does not have Pastors. The fact that he would lie about something regarding his faith this openly tells me that this man will say anything to get elected. The reason he used the word "Pastor" was to influence the evangelical vote. The FACT that evangelicals have classified the Mormon religion as a cult for years and then suddenly a senile Bill Graham, a man that has taken millions for people promising salvation only to spend it on himself. Suddenly removes the word cult and this allows Romney then proclaim he is a "Pastor". Lie Lie and more lies. Anyone that would lie about their church and their faith cannot be trusted. Christians you have said it yourself. You cannot over look this fact. Either you flip flop on your faith like Mitt or you uphold your standards in doing what is right and telling the truth. But I know you it will be no big deal and will be over looked and passed under the table. That is called hypocrisy. Anna smith, Obama has no details only blame. 4 more years of lies? Candy - please stay out of the discussion and DO NOT interject your misleading statement about what the Double-Talker In-Chief did actually say in the Rose Garden. The facts are: The Double-Talker In-Chief doesn't care to listen to his daily security briefings. So this is why we have the Libya mess and why he lied and had others lie and cover for him for almost 2 weeks. I guess he forgot that he said it was the VIDEO that caused the deaths to our Americans during his UN speech. What a joke and amateur. Less than 3 weeks and I pray we finally have a real American leader back in the Oval Office. The President said "I want high wage, high skill jobs". Mr. President, how about decent paying middle class jobs for those of us who can’t afford the time or the money to go to college, more decent paying living wage jobs = more growth = overall tax revenue.